These plans are for the construction of vertical axis wind turbine, modelled after a design by the Finnish engineer S. J. Savonius in 1922. His idea was to mount two half-cylinders on a vertical shaft. It was simple to build, and could accept wind from any direction. However, it was somewhat less efficient than the more common horizontal axis turbine. The reason for the difference has to do with aerodynamics. Horizontal axis turbines have blades that create lift to spin the rotor, whereas the vertical axis design we are using here operates on the basis of drag—one side creates more drag in moving air than the other, causing the shaft spin. 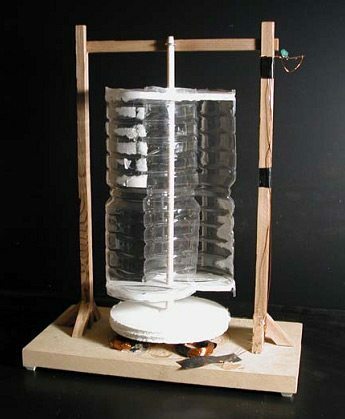 This wind turbine model makes its electricity with a simple generator which produces pulses of current, or alternating current. It does so by passing strong magnets over coils of fine wire. 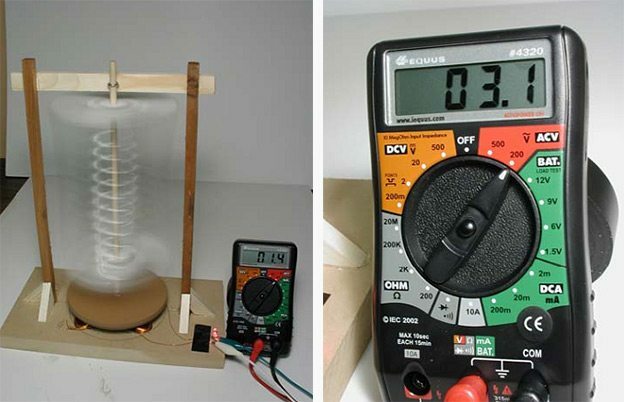 Each time a magnet passes over a coil, the coil becomes energized with electricity. With 4 coils connected together in series, the result is a quadrupling of the voltage. This is the simplest and possibly most efficient way to generate electricity, and is the same basic principle used in almost all wind turbines, even the large scale commercialones. The electricity from a wind turbine varies with the wind speed, so to make practical use of it, you must be able to store it in batteries, or change it into a form that gives a stable, constant voltage. Usually, electricity from wind turbines is converted from alternating current to direct current, which can be used for battery charging. You can find plans on the Internet for simple electronic devices called bridge rectifiers. Bridge rectifiers consist of just 4 diodes, and can be made for just a few dollars.